Oh ... forgot about the android screen ... then hopefully everything will work. So when you plug the OBD2 in, it may not work, try again because each time you plug-in it will either turn on or off the activation. Also, the USB cable makes a difference, always try it with the original cable that came with the phone first. 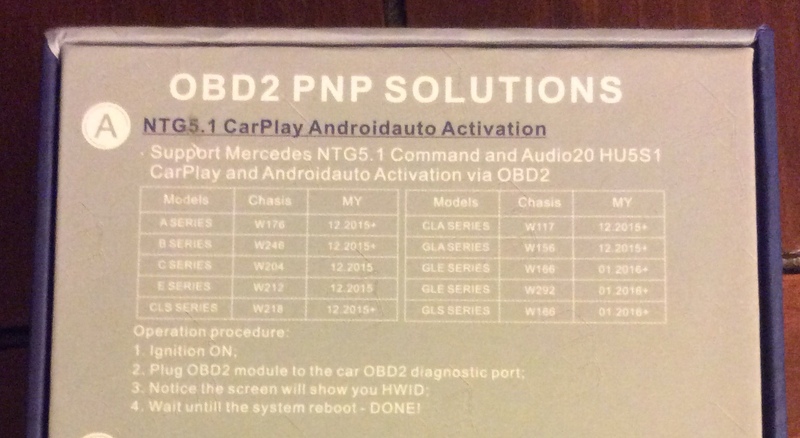 Most of these OBD2 that I have seen always list delivery date to be 12/2015 or later. They however do not say which version of HMI, it should be at least 06/2016. Found my box for the Unichip OBD2. They assume you have the latest HMI. Last edited by firstdown80; 03-09-2019 at 11:34 AM. can you please give a review of the car play after install? any issues? Works fine with the general apps, like message texting, whatsapp, phone, google maps, music. Sportify works fine generally, but if you try to use another app that have a conflict with sportify in carplay, the sportify will be behave erratically. Speech to text and text to speech functions for messages works well. Is there Waze for it? Does the phone have to be directly plugged in USB always or can it be via bluetooth to access apple car play?? Got priced in for $249 after tax. Yes, Waze works great on carplay in the MB app. But you have to set it up in Waze to be the primary nav app or when you call up for nav guidance, siri will call up google maps by default.